Descubra as camadas históricas de Roma durante um curto passeio a pé pelos seus principais locais. Com um guia, você confere os favoritos dos visitantes, como a Fontana di Trevi, o Pantheon e a Piazza Navona, além de animadas praças cheias de arte como a Piazza Barberini. Ouça as histórias por trás dos pontos turísticos enquanto passeia e posa para fotos pelo caminho. O passeio matinal termina a uma curta caminhada do Vaticano, tornando-o uma escolha perfeita se você planeja explorar o Vaticano mais tarde sozinho. Ricardo was great and very informative! 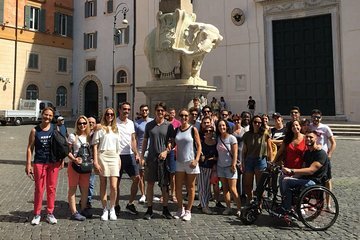 We learned a lot on the tour and it was a great way to see some of the most famous site of Rome Trevi Fountain, Pantheon, and Piazza Navona. This tour is such a wonderful value, we couldn't believe it! One note: on our particular tour we did not go into the Pantheon due to issues with dress code. I would leave 30 minutes after the tour free to make sure you have time to see it. Great guide, great route. The guide was young and energetic, made the brisk morning and long route fun and interesting. Loads of advice on getting around Rome and what to look for in the monuments we visited.